The recently released Post-Synodal Apostolic Exhortation contains many good things, but is also filled with passages that are overwrought, exaggerated, and lacking. The post-synodal apostolic exhortation on youth, Christus Vivit (hereafter, CV), has arrived. The first, and most important, point to make is that the worst predictions of some of the prophets of doom have not been realized: there is no heresy in the document; in fact, there is very little theology in the document (about which more momentarily). What is good is very good; the rest, for the most part, is banal. Years ago, a very wise cardinal told me that if you wanted to get a quick overview of a work, check the footnotes. CV has 164 footnotes. According to my calculation, 56 of them are citations from the Final Document (FD) of the synod on youth; 61 of the footnotes are from Pope Francis himself. Now, all popes have been self-referential in their writing, but this is a bit much: over 40% of the material from the current author? The Fathers of the Church are cited five times, and the Catechism of the Catholic Church comes in for two. Pope Benedict makes it twice, just like his predecessor, Pope John Paul II. Imagine: JP2 – the Pope of Youth – is quoted only twice! In this overview, I would like to proceed by way of chiaroscuro – reflection on both lights and shadows. A dozen young saints are highlighted, from various times and places. That section concludes with a great aspiration: “May these and so many other young people who perhaps in silence and hiddenness lived the Gospel to the full, intercede for the Church, so that she may be full of joyous, courageous and committed young people who can offer the world new testimonies of holiness” (63). While it is certainly true that “many young people, whether by force or lack of alternatives” do evil things, it is equally true that not a few consciously choose to act in such ways. Dear young friends, do not let them exploit your youth to promote a shallow life that confuses beauty with appearances. Realize that there is beauty in the labourer who returns home grimy and unkempt, but with the joy of having earned food for his family. There is extraordinary beauty in the fellowship of a family at table, generously sharing what food it has. There is beauty in the wife, slightly dishevelled and no longer young, who continues to care for her sick husband despite her own failing health. Long after the springtime of their courtship has passed, there is beauty in the fidelity of those couples who still love one another in the autumn of life, those elderly people who still hold hands as they walk. There is also a beauty, unrelated to appearances or fashionable dress, in all those men and women who pursue their personal vocation with love, in selfless service of community or nation, in the hard work of building a happy family, in the selfless and demanding effort to advance social harmony. To find, to disclose and to highlight this beauty, which is like that of Christ on the cross, is to lay the foundations of genuine social solidarity and the culture of encounter. 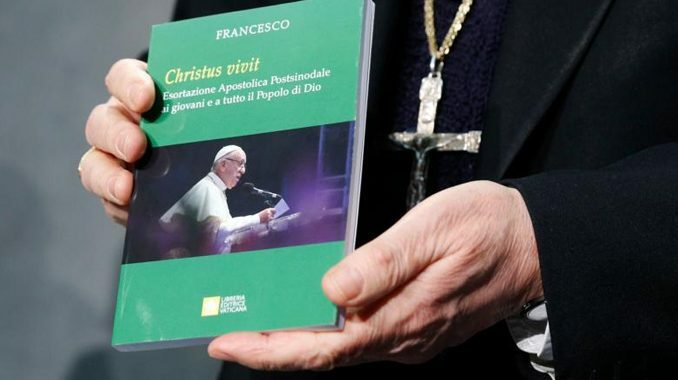 Francis also urges youth to beware of “attempts to promote a spirituality without God” (184) and of those who seek to create “a rupture between generations” (191). My professional educator’s heart was gladdened that the paltry reference to Catholic schools in the FD has been expanded to three paragraphs in CV. And so, we are reminded that “schools are unquestionably a platform for drawing close to children and young people” (221) and that “Catholic schools remain essential places for the evangelization of the young” (222). In “areas needing to be developed,” one might be led to believe that Francis has been reading Cardinal Sarah: “Many young people have come to appreciate silence and closeness to God.” He praises the increase in youth “groups that gather to adore the Blessed Sacrament and to pray with the word of God” (224). He also sees the arts, and particularly music, as “pastoral resources” for reaching the young, as well as “various manifestations of popular piety, especially pilgrimages” (238). He also wisely highlights “a special need to accompany young men and women showing leadership potential, so that they can receive training and the necessary qualifications” (245). Here we Americans can showcase the wonderful work done by FOCUS missionaries (Fellowship of Catholic University Students) on our college campuses. Other practical elements: “I ask young people not to expect to live without working” (269); the fear of “the replacement of many jobs by machines” (271); the importance of young people having “the chance to decide what kind of work they will do” (272); discovering one’s true vocation enables one “to summon up our best capacities for sacrifice, generosity and dedication” (273); “the importance of the formation of conscience, which allows discernment to grow in depth and in fidelity to God” (281). “Discernment” has become a mantra for many to justify remaining in neutral. What can be done to eliminate that difficulty? When seeking to discern our own vocation, there are certain questions we ought to ask. We should not start with wondering where we could make more money, or achieve greater recognition and social status. Nor even by asking what kind of work would be most pleasing to us. If we are not to go astray, we need a different starting point. We need to ask: Do I know myself, quite apart from my illusions and emotions? Do I know what brings joy or sorrow to my heart? What are my strengths and weaknesses? These questions immediately give rise to others: How can I serve people better and prove most helpful to our world and to the Church? What is my real place in this world? What can I offer to society? Even more realistic questions then follow: Do I have the abilities needed to offer this kind of service? Could I develop those abilities? Asking such questions forms part of “spiritual combat” (295). Now, for the less palatable items. First of all, the document is way too long for anyone to go through — it is nearly 33,000 words in length, not counting footnotes — let alone young people who think that being assigned a two-page article is an impossible demand! The use of the word “dream” is overwrought – 56 times, by my count. All I could think of was the Everly Brothers hit from 1984: “Dream, dream, dream, dream.” And then comes the punch-line: “I’m dreamin’ my life away.” Unfortunately, that is what all too many young folks are doing. Dreaming is good, but it must be connected to reality. A kid who is 5’6″ and 115 pounds can dream all he wants about becoming the star quarterback for Notre Dame, but it ain’t gonna happen! Having unrealistic dreams only leads to frustration and eventual inaction. The constant encouragement to listen to the elderly may have been good counsel fifty years ago, however, in my pastoral experience much of the socio-cultural meltdown has been forged by the over-65 crowd. Imagine an 82-year-old woman confessing adultery because she envied her grand-daughter’s sexploits! If anything, the younger generation is often more open to the truth than their seniors, who not infrequently are still rebelling against the supposed rigidity of their upbringing. • The word “cross” can be found fourteen times. In paragraph 83, youth are encouraged to go to Jesus to be relieved of their crosses, and paragraph 119 has a powerful reflection on what Christ has wrought by His Cross. However, nowhere do we hear about the necessity of every disciple’s carrying of his or her own personal cross. After all, our blessed Lord was very clear on this: “Whoever does not bear his own cross and come after me, cannot be my disciple” (Lk 14:27). Pain and suffering are a part of every life; not to give young people the Christian prescription for dealing with these is neglectful, pastorally speaking. • The Pope expresses concern about young people being “protected from all contamination” (30). While we ought not raise them in a bubble, preservation from near occasions of sin would seem to be a good thing. • What are we to make of this paragraph? This is rather bizarre. Just how are youth to accomplish this? The Church has been “listening” all too long and has been rather short on speaking, with the result that the ship of the Church has been taking on a lot of water. Having listened (and, yes, that is important), she then has an obligation to speak – indeed, that is her primary responsibility given her by her divine Master’s “Great Commission”: “Go therefore and make disciples of all nations, baptizing them in the name of the Father and of the Son and of the Holy Spirit, teaching them to observe all that I have commanded you; and lo, I am with you always, to the close of the age” (Mt 28:19-20) . And where does the Church “battle obsessively over two or three issues”? Of course, that line is ironic coming from a man who truly does “obsess over two or three issues” – immigration, clericalism, legalism, for example. The Church is – and will be more and more – “on the defensive.” Does a day go by when some militant secularist does not attack the Church? And does not 1 Peter 3:15 command us to be ready to give an answer? Would we not defend our mother from unjust assaults? Can we do any less for the Church, our Mother? • Paragraph 42 gives the impression that the Church has been – and largely still is – an oppressor of women. History, however, tells a different story. It was the Church that raised the status of women, giving them roles and responsibilities unthinkable in most religions and cultures before, as teachers, theologians, philosophers, abbesses, reformers. We get more of the same later on: “Some young women feel that there is a lack of leading female role models within the Church and they too wish to give their intellectual and professional gifts to the Church” (245). At least in the United States, the women religious of yesteryear surely provided “female role models,” until the vast majority of them went over the cliff. Thankfully, others did not and they do, in fact, give powerful witness to the genius and contributions of women in the Church. A diabetic would be in a coma after all that sugar and honey. • “Young people are aware that the body and sexuality have an essential importance for their lives and for their process of growth in identity” (81). Are young people really “aware” of this in a profound way? Sadly, this document offers no guidance on how they could or should integrate such awareness into their daily living and experience. Amazingly, the Ten Commandments are never mentioned. • Out of the blue, paragraph 104 introduces us to Carlo Acutis. I never heard of him, and after three paragraphs, I still don’t know who he was. Similarly, paragraph 108 quotes “a great poet,” again another great unknown. I cite these because they demonstrate a recurring papal failing: coming at situations from a very limited horizon and supposing that everyone else shares that vision. • Paragraph 113 notes that “perhaps your experience of fatherhood has not been the best.” It goes on to link that experience with how it affects one’s relationship with God the Father. Fair enough. However, I must say that I grow weary of hearing exclusively of bad fathers. Are there no bad mothers? Even-handed critiques actually accomplish far more than one-sided ones. This Pope has a propensity for canonizing mothers and grandmothers, while barely acknowledging fathers – and when he does, it is often a broadside like this. Now, I have been involved in education for decades, and I have met precious few young persons who fit this profile. Perhaps the Pope was describing kids during the Depression. Truth be told, the average young person today is immobilized into indecision and lives in fear – joyless and hopeless, hence, the high suicide rate for the young. Who talks like that? Who could imagine that such silly expressions would resonate with youth? Can any papal collaborator convince him that language like this just causes raucous laughter? • “Friendship with Jesus cannot be broken” (154). Of course, it can; that is precisely what mortal sin does. I suppose the Pope means that Jesus is always waiting for us to return to Him and, in that sense, He remains faithful, even when we are not (cf. 2 Tim 2:13). However, it is just such lack of theological precision that gets this Pope into so much trouble so often. • In paragraph 158, youth are encouraged to “stay connected to the Lord,” but they are not told how to do that. • An entire section is devoted to “paths of fraternity,” actually very good, but I would have preferred to use the word “communion” (a truly theological word), rather than “fraternity.” “Communion” exists among the Persons of the Blessed Trinity; we have “communion” with the Triune God through the life of grace which comes to us in the sacraments; due to the vertical communion we have, we then share in a horizontal communion. As for outreach, I trust that young people themselves know how best to find appealing ways to come together. They know how to organize events, sports competitions and ways to evangelize using social media, through text messages, songs, videos and other ways. They only have to be encouraged and given the freedom to be enthused about evangelizing other young people wherever they are to be found. Once again, the Pope must know kids from an entirely planet from those I have worked with over the years. “They know how to organize events”? You have got to be kidding! As for growth, I would make one important point. In some places, it happens that young people are helped to have a powerful experience of God, an encounter with Jesus that touched their hearts. But the only follow-up to this is a series of “formation” meetings featuring talks about doctrinal and moral issues, the evils of today’s world, the Church, her social doctrine, chastity, marriage, birth control and so on. As a result, many young people get bored, they lose the fire of their encounter with Christ and the joy of following him; many give up and others become downcast or negative. Rather than being too concerned with communicating a great deal of doctrine, let us first try to awaken and consolidate the great experiences that sustain the Christian life. What “fearlessness” are we talking about, inasmuch as they have never been presented with a challenge? Further: Should not good mentors alert their charges to the pitfalls and sand traps that lie before them, so as to minimize “error, failure and crisis”? • Short shrift is given to the liturgical/sacramental life of the Church (cf. n. 229 and a few other places). In this, I suppose, the Pope is a loyal son of Ignatius Loyola, who does not discuss such matters in his Spiritual Exercises. As a result, youth ministry is reduced to social activism and a “feel-good” making of “fraternity” – a scout meeting that begins with a prayer (maybe). • For me, Chapter Eight, devoted to vocation, is, the most disappointing of all. First off, the Pope gets the passage in John 21 all wrong in declaring that Jesus asks Peter, “do you love me as a friend?” (250). On the contrary, the Risen Lord asks Peter if he loves Him sacrificially (agape), to which Peter responds with the love of a friend (philia). The pattern is repeated a second time. A third time, Our Lord “settles” for Peter’s lesser love – that of a friend. No, Jesus extends sacrificial love to us and expects the same in return; He will, however, take whatever we can give. Unfortunately, the Pope lowers the bar at the starting gate. God has created me to do Him some definite service. He has committed some work to me which He has not committed to another. I have my mission. I may never know it in this life, but I shall be told it in the next. I am a link in a chain, a bond of connection between persons. He has not created me for naught. I shall do good; I shall do His work. I shall be an angel of peace, a preacher of truth in my own place, while not intending it if I do but keep His commandments. Therefore, I will trust Him, whatever I am, I can never be thrown away. If I am in sickness, my sickness may serve Him, in perplexity, my perplexity may serve Him. If I am in sorrow, my sorrow may serve Him. He does nothing in vain. He knows what He is about. He may take away my friends. He may throw me among strangers. He may make me feel desolate, make my spirits sink, hide my future from me. Still, He knows what He is about. • “The vocation to special consecration” is treated in four brief paragraphs (274-277). This is embarrassingly weak. And even in what purports to be a pitch for priestly vocations, he feels compelled to talk about “priests who do not give good witness.” And we wonder why the numbers of seminarians and ordinations have been on a steep decline for the past five years? Well, we have come to the end of our review of a painfully long document (of course, John Paul wasn’t given to terseness of expression, either). As in many pontifical documents, we encounter inconsistent styles, approaches and vocabulary – the work of many hands, undoubtedly – but certainly not well edited. Some enterprising youth minister might cull all the good material, reduce it to a readable pamphlet, leaving out the trite and/or problematic passages. Maybe I have given such a person just the right start. Thank you, Fr. Peter, for wading through the nearly impenetrable thicket of Pope Bergoglio’s thinking and bringing back some worthwhile souvenirs. Myself, I would never risk such a journey. I’m pretty sure my logical machete not be incisive enough to penetrate such an overgrown and inscrutable jungle. During the Papacy of Benedict XVI, did you refer to him as “Pope Ratzinger”? During the Papacy of John Paul II, did you refer to him as “Pope Wojtyla”? During the Papacy of John Paul I, did you refer to him as “Pope Luciani”? During the Papacy of Paul VI, did you refer to him as “Pope Montini”? Would you dare refer to Pope St. John XVIII as “Pope Roncalli”? Or to Pope Pius XII as “Pope Pacelli”? Or to Pope Pius XI as “Pope Ratti”? Or to Pope Benedict XV as “Pope della Chiesa”? You know full well that you did not and would not. Well, apply the same to the current Pope, regardless of whether or not you like what he says and does (and I certainly do NOT like what he says or does, but I still refer to him properly as “Pope Francis,” and only that). I beg to differ. It is extremely common to refer to popes by their family name — and yes, if you check my writing during the two previous pontificates, you will see that not infrequently I did that. Furthermore, several times in my article, I did refer to the current pope as “Francis.” So, let’s stop trying to parse something that doesn’t admit of the process. p.s. : When Pius XII answered his phone, he said: “Pacelli qui” (Pacelli here). Perhaps he didn’t think he was a pope? 91-94 may be “straightforward” but they have nothing that pertains to the Natural Law or to Divinely Revealed Law. Agreed. Minus any resolution to not hang out, to not be friends with young people who do bad things…it’s just a bunch of nonsense. Such a resolution to avoid bad companionship was Step 1 for St. John Bosco, I believe. For sure we cannot “raise them in a bubble,” fleeing every interaction…but as Catholics, we need to reclaim the Aristotlean/Thomistic value of friendship which involves “virtue.” And this notion that the role of young person is to “save the Church” and also to save their classmates? beyond first and foremost their own good example…is nonsense. And save what really if “What does it profit a man…” is nowhere around. How many times does the word “virtue” appear in this document? What frequents gets supplied in reply…”Well Jesus ate with sinners…” Yes, God Incarnate…who came to save sinners. Related to this documents are various depictions…that all the kids ever get in Church are “rules,” guilt trips and talking about sin…really? That would be someone joking. Not in most parishes for a long long time. It is good to begin with “Christ lives!” but what about what follows? What gets devalued, discarded and sometimes put to death is much of St. Paul and the Epistles…and yes, the hard sayings in the Gospels. Are we at all surprised at this? Is this not simply more jesuit-speak ambiguity masquerading as deep thought from a man unqualified for the position he holds? From a man who despises clarity? April 8th: Not a bad review – but too long by far and rather nitpicking! As far as this passage: “As for growth, I would make one important point. In some places, it happens that young people are helped to have a powerful experience of God, an encounter with Jesus that touched their hearts. But the only follow-up to this is a series of “formation” meetings featuring talks about doctrinal and moral issues, the evils of today’s world, the Church, her social doctrine, chastity, marriage, birth control and so on. As a result, many young people get bored, they lose the fire of their encounter with Christ and the joy of following him; many give up and others become downcast or negative. Rather than being too concerned with communicating a great deal of doctrine, let us first try to awaken and consolidate the great experiences that sustain the Christian life.” I recall Pope Benedict saying something similar about not starting people off with teaching them rules and regulations; rather to lead them to Christ and His Church though showing them the beauty and goodness she offers which will lead them to the source of all beauty and goodness. Christ has rules and regulations. You cannot divorce Christ from His rules and regulations. To do so would be to give them a Christ made in your own image. What comes across as the Pontiff’s message is suggested, perhaps inferred by textual comparison. For example in your highlight quotes, “In 83, youth are encouraged to go to Jesus to be relieved of their crosses. 119 Nowhere do we hear about the necessity of every disciple’s carrying of his or her own personal cross. We are told that ‘as members of the Church, we should not stand apart from others’ (36). The Church needs to stand against the world, precisely for the world”-the message apparently more inferred than suggested, which you seize upon in your summary of that section is accommodation rather than exclusivity of life in Christ. And only, as implied in your preliminary summary by an exclusive adaption to Christ can Youth be Light leading others out of the Darkness. Why so much cellulose devoted to 33,000 words, if not cobbled together from a collage of unnamed, surrogate popes–so much of it obscuring or muddling or even omitting salvageable references to the Word? The Wikipedia entry and many cited literary uses of the original Judy cartoon witticism seem to miss entirely the intended irony. A spoiled egg will make one quite ill, and can hardly be unnoticed by anyone with a nose (such as the bishop): therefore the tainted egg refers to a suspect bit of theology that would be closer to poison than viaticum. In its day, liberation theology mightn’t be quite obvious on the horizon (though it was there), but it would be a perfect smelly example from 1960 onwards. And yes, it would seem that in the guise of youthful activism without a care for the pitfall of the pride of youth (ne’re a caveat against pride in the whole thing), CV is a devilled egg. So, the question: to drink or not to drink a glass of orange juice laced with half a cup of arsenic. Does any one think that any “youths” are going to read this? Perhaps a fe…….no, not even that many. It’s ridiculous. The young have better things to with their time than translate insufferable jesuit-speak. You know as a father of 3 teenage sons I don’t go out of my way to be their friends. Instead if they make bad decisons I tell them to shape up and discuss in length the consequences of poor decisions. And I tell them I don’t care what they think if they live ‘Under my roof’ they have to live by our rules as their parents. Recently, one of their Scout Masters told me how much they respect me as their father. I got teary eyed and thanked God for his guidance and pray every day dot continued wisdom in my vocation as a Chritian parent. Thank you for the Newman quote. I needed it, today. I have been teaching teenagers at a Mexican conservative Catholic High School for the past 13 years, and I can say that “Christus vivit” is an extraordinary and very well written document. It touches the heart of many problems that worry our youth. It has many powerful insights based on the Bible and the wisdom of the Saints. When teenagers are appropriately motivated, they can read complete books, and most of my students can (and will) read this papal exhortation (74 pages isnt’s really that much). I do not concur with the mainly negative interpretation that Fr. Straviskas has given to this document, even though he highlights some positive aspects of CV. I think all of CV is exceptional!! Perhaps the author of this article belongs to another generation of teachers or maybe, because of the generational gap, he can´t “connect” that well anymore with 16-year olds that belong to generation “Z”. That is why I think he doesn´t really know modern day teenagers, even though he has taught them for “decades”, and perhaps his rather pessimistic view of teenagers does’nt describe them with complete justice. “Who talks like that? Who could imagine that such silly expressions would resonate with youth? Can any papal collaborator convince him that language like this just causes raucous laughter?”, referring to paragraph 143 of CV, perhaps he should ask himself if he has not lost a healthy sense of humor (and also respect for the successor of Saint Peter). I encourage everybody to read “Christus vivit” directly. You will enjoy it, learn a great deal from it, and take many of it’s wise insights to prayer and to life. At least, I have. Thanks and God bless you!! It’s easy to see that you don’t like Pope Francis. From this point of view, you criticize the text, for reasons are quite debatable. For me, it’s a joy to read every text of Pope Francis. It is easy to understand, not only for the priests. You criticize his style, for not being theological precise. Nevertheless, you forget that the aim of this document is precisely the youngest, and it’s easy to understand Francis try to adapt the style. I found that the reason of your critics is the hostility. The same hostility shared for many priest and bishops. You can’t forgive him for being who he is and act as he acts. I’m a priest, too, and I’m involved in young people education. And I share the way Francis is guiding the church and the way he tries reforming her. Greetings from Spain. So…the young don’t care about theological precision? Or shouldn’t? Huh. “You can’t forgive him for being who he is and act as he acts.” A nonsensical statement. Good grief.